Reese is on a debate team field trip with her longtime crush David when disaster strikes. All over the country, flocks of birds fly into the engines of planes, causing them to crash and killing thousands. Since the government grounds all of the flights from then on, Reese and David rent a car and decide to drive home to San Francisco from their trip in Arizona. When a bird flies straight at their car and causes them to crash somewhere near Area 51, Reese thinks that they will both be killed. However, they wake up in a military hospital in Nevada, miraculously healed of all injuries. They are forbidden to speak of their treatment and are sent home to their parents, where things seem to have changed in their absence. This book started off really great but quickly went downhill. The whole concept seemed really interesting–I found myself really interested in the whole idea of a government cover up and I couldn’t wait to find out the real reason behind the airplane crashes. However, midway through the book the whole thing fell apart and I found myself not really caring about the main character or the cover up at all. Reese was kind of an annoying character. She has this completely weird aversion to relationships because of her parents divorce–she tells herself she will never be in a relationship with anyone. Yeah, not really a healthy thought. So she tries to ignore her feelings for David and then completely wigs out when he seems to show some interest in her. After they get in the accident and are told that they have to sign a bunch of paperwork stating that their treatment is confidential and they are not allowed to talk about it, Reese does so with very little resistance. Um, what? Some random people in the middle of nowhere heal you from near death and then tell you that you can’t talk about it, and you just…sign paperwork agreeing to this? At least try a little harder to find out why!! What bugged me most about this book though was how much of it seemed contrived and out of place. I felt like the book switched genres halfway through and went from a sci-fi/apocalyptic type story to contemporary romance and then back again. The whole middle of the book was about Reese’s relationship with a random girl she meets named Amber, and while I understood the whole new love/discovery of oneself and all that stuff (which was actually really well done writing-wise), it just seemed out of place in the story. Once Amber came into the story, a good chunk of the book seemed more of a contemporary coming of age story and then dove right back into the sci-fi stuff. Also, the whole thing with Amber was very predictable from the start. Overall, Adaptation started off good but then quickly failed to hold my attention. It had a lot of potential but unfortunately just flopped in my opinion. 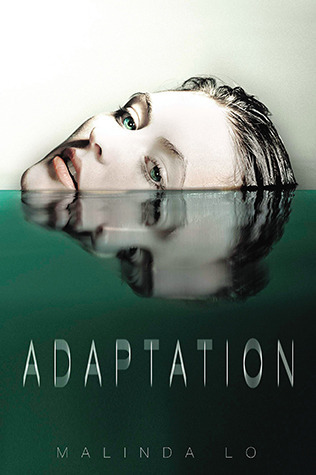 Adaptation was released on September 18, 2012 and is the first book in the Adaptation series.